As the Army readies the next version of its Information Technology Enterprise Solutions program, service leaders are taking steps to ensure greater use of performance-based contracting on ITES 2 projects. Task orders awarded under the ITES 1 program did not incorporate as much performance-based contracting as Army officials anticipated. With a request for proposals for ITES 2 slated for release within a month or two, service officials are laying the groundwork for more performance-based approaches in the new program. Kevin Carroll, the Army's Program Executive Officer for Enterprise Information Systems, oversees ITES 2. Eight companies won places on the ITES 1 contract, which had a $1 billion ceiling, to provide a wide range of IT products and services aimed at enterprise solutions and consolidation. Carroll said he expects ITES 2 to have an even larger ceiling. Carroll manages programs that support acquisitions, logistics, personnel, medical, training, finance and transportation operation, among other things. Previously, he was the assistant deputy chief of staff for research development and acquisition at the Army Materiel Command. 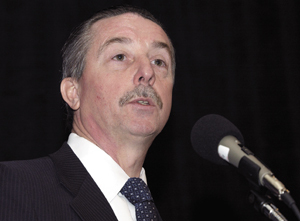 He also served as acting director of the Communications and Electronics Command's Acquisition Center at Fort Monmouth, N.J.
Carroll spoke with Dawn S. Onley, a staff writer with Government Computer News, about performance-based contracting and the ITES vehicle. WT: What was the Information Technology Enterprise Solutions contract's aim? Was it supposed to be performance-based? Carroll: We really wanted to do a lot of performance-based contracting, especially as we consolidated computers and servers all across the Army, and then outsource the work in a performance-based manner. When we did ITES, we figured about 50 percent of the orders would be decentralized, meaning a local contracting job would place an order somewhere in the Defense Department. These are people we couldn't control. But we expected about 50 percent of the orders would come from the chief information officer of the Army, which would give us money to do performance-based contracts. What happened in practice was the Army CIO didn't have the money to execute the consolidation, so pretty much all ITES money has been decentralized, although we have tried to go out and educate people on performance-based contracting. WT: What are your plans for ITES 2? Carroll: Our plan when we do ITES 2 is to take the lessons learned from ITES 1 on performance-based contracting. The Army CIO has planned funding to do some of this consolidation, so we're hoping we get back to the 50-50 plan ? therefore we have more control of it. We're going to try to bring our customers in earlier and try to get them more engaged early. What we anticipate happening is, let's say we're creating a big server farm, and we're going to outsource it. We kind of expect that [customers] would order any hardware off ITES and put together a solution to implement that. We're hoping the whole package could be performance contracting. Another lesson learned that may help us a little for ITES 2 is that when we did the first ITES, we made up sample tasks that were part of the evaluation process based on a best guess. Now we have some consolidations that have been done around the Army, so our statements of work are going to be meatier. Hopefully, that will help us in our evaluation process amongst the companies. Right now, we're kind of wishing that we had limited ITES to the Army, because we're [approaching] the ceiling quicker than we thought. WT: What have been the challenges of doing performance-based contracting with ITES? Carroll: We want to have an off-the-shelf training package ready to go that both we and the winning contractors can use to educate our customers. Most [customers] want to do performance contracting, but it's kind of hard to do. They have to write the objectives and goals and what metrics they want to measure. That's not easy to do. In fact, that's not easy for companies to do. Our biggest lessons learned with this performance-based stuff [is] people just don't know it. Other than that, I think the contracts have been working as planned. We've been using Acquisition Solutions Inc., and they've been helping us as well as some of our customers. They're independent, they focus on government clients. WT: When will the request for proposals for ITES 2 be released and the awards made? Carroll: ITES 2 will be awarded in the April-to-May 2005 timeframe. There might be some end-of-year ordering on it for fiscal 2005, but it will probably be fiscal 2006 where it will really get some use. We're trying to get a draft RFP out in the fall, October or November, and an RFP in January. WT: What's the likely ceiling for ITES 2? Carroll: It will be over $1 billion. There are a lot of people who will play in that decision. The ceiling is important, because its size obviously would lead to the question of the number of awards. WT: Is ITES the Army's answer to the Navy-Marine Corps Intranet or Air Force's Netcents IT products and services vehicles? Carroll: Yes and no. Obviously, NMCI was a single outsourced contract in which companies invested a lot of money. With Netcents, the contract mechanism is more similar to ours, and they will do competitive awards. Some of the vendors are even the same as with ITES. Contractually they're similar, but the work is different. They're much more communications focused, and we're focused on the installations and the consolidations that we're doing in the Army, more server kind of stuff v. communications kind of stuff. We're still talking about having Army processing centers around the world, and ITES could be used to do that. Anything we do regionally in the Army or with the installations ITES will be set to do. WT: Will there be an ITES 3? Carroll: I don't know. I guess it depends on how quickly we reach the ceiling. Eventually, probably in five years or so, there would be. Dawn S. Onley can be reached at donley@postnewsweektech.com.